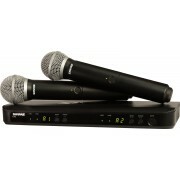 The Sennheiser XSW 1-825 bundles great sound and ease of use into a sleek handheld wireless system. 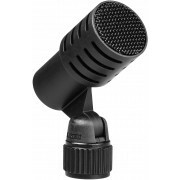 The transmitter employs an 825 cardioid capsule with a warm, smooth sound and excellent feedback rejection. Convenient features like one-button scanning and synchronization are housed in a streamlined receiver with built-in antennas. Intuitive icon-based indicators make operation a piece of cake. Use up to 10 systems simultaneously. 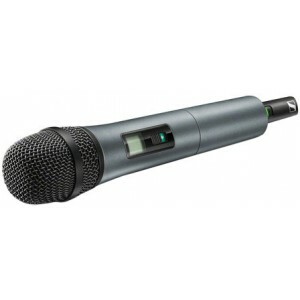 The Sennheiser XSW 1-825 is a great handheld wireless system for singers, presenters, and instrumentalists. The Sennheiser XSW 1-825 is outfitted with their 825 capsule. 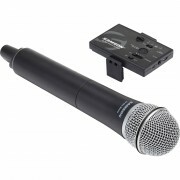 For a great all-around stage mic, you can't beat the 825. Its cardioid pickup pattern yields superior feedback and off-axis rejection. 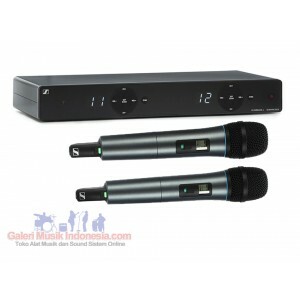 Its balanced frequency response exhibits a warm, smooth sound. You'll also appreciate its resistance to handling noise. 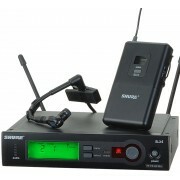 Receiver: Dimensions:5" x 7.8" x 1.6"